To gain a sustainable competitive advantage over their counterparts across the globe, there is an urgent need for Indian MSMEs (micro, small and medium enterprises) to adopt information and communication technology (ICT), says Dinesh Agarwal, Founder and CEO, IndiaMART InterMESH Ltd, Noida. “MSMEs play a crucial role in the development of the Indian economy. They account for nearly 45 per cent of our country’s manufacturing output, 40 per cent of total exports and provide employment to nearly 65.9 million people. The rate at which the sector is growing is commendable. As a result of globalisation, the sector is exposed to fierce competition,” he reasons, during a recent interaction with Business Line. Our conversation continues over email. In what areas of market access do you see the role of ICT, for MSMEs? Reaching out to the right target audience is important for any business, to enhance competitiveness; and, many believe this involves huge investments. While large enterprises have huge sums of money to invest, MSMEs have limited budgets for this purpose. In such a case, ICT plays a huge role, given that it has now become easily accessible and affordable for almost everyone. By leveraging ICT, MSMEs can reach out to global customers for their products and services. For instance, with B2B portals, they can break geographical barriers and market their products to global customers at minimal costs and less time. The registration, which is free, on these portals gives them instant access to business tenders, trade offers and allows them to showcase their products and services to multiple vendors. They also get better sourcing partners for their input material and can also gauge competitor’s offerings to understand industry trends. All this helps MSMEs to remain competitive and achieve business growth. Other ICT solutions such as social media marketing, email and SMS marketing also enable them to maximise their reach. These solutions don’t require huge investments and are easily available online. ICT has immense potential for improving the efficiency and productivity of MSMEs with respect to their different business functions such as marketing, HR, finance, and operations. ICT can generate a change among MSMEs and make them more competitive, innovative and generate growth. For instance, ICT facilitates the selective automation of processes related to supporting the field sales force and integrating sales activity into the company’s information structure. They provide ready access to a vast array of global information resources and facilitate the gathering of valuable competitive knowledge and consumer-related information that simplifies marketing decision processes. The penetration of ICT among MSMEs in India is very low. MSMEs must leverage different ICT tools to increase productivity and achieve business growth. Various free and low-cost services are available online, which can be used by them to gain efficiency for the entire range of business processes. There are two categories of tools and value-added services that can be accessed using the Internet: the ones that are downloaded into one’s PC and used online or offline; and the ones that are used online by using the Internet. 1) Marketing: For marketing purposes, B2B marketplaces are a great help to MSMEs. They reach out to global buyers and sellers, offer a free, readymade marketing platform to the MSMEs, helping them access hidden markets, find relevant business partners and have 24×7 online presence. Even social networking sites such as Facebook, LinkedIn, twitter or even blogs, document-sharing sites such asslideshare.net, enable MSMEs to connect with their target audience globally. 2) Accounting: There are numerous free downloadable tools as well as online platforms that can be used for accounting. Applications such as Tally, myAbacus, and Numia, and downloadable tools such as adminsoft accounts make it easy for MSMEs to perform their core accounting operations. 3) Human resources: MSMEs can utilise job sites such as naukri.com, monster.com, etc, to recruit the required people for their enterprises as per their requirements. 4) Business communications: While email is one form of technology which every firm uses for regular communication, there are other ICT tools that serve different purposes of communication. These include surveymonkey.com for free online professional surveys, yousendit.com for huge file/document transfers, Googledocs for document sharing, and several hundreds of other such online tools and applications. Is ICT helping MSMEs in sourcing, too? ICT has opened several doors for MSMEs offering cost-effective methods to conduct business. As mentioned earlier, with the advent of B2B marketplaces as well as search engines, they get an easy and direct access to business partners across the globe. It helps them interact with potential suppliers and buyers alike, and have a 24×7 online presence, thereby making it easier for both to connect online for free or at lower costs. According to a study by IAMAI (Internet and Mobile Association of India) on ICT usage by MSMEs, 55 per cent of the MSMEs are already subscribing to online B2B marketplaces to promote and sell their products or services. This ensures a huge aggregation of small and medium business which serves both purposes of trade – viz. sourcing and supplying. On these marketplaces, products and business offers are displayed through various business directories, online product catalogues, buy-sell offers, sourcing guides and so on. MSMEs can view the offerings and contact the suppliers through email or phone for free for their specific sourcing requirements. Are large enterprises connecting with MSMEs using technology? ICT tools have completely revolutionised the way of doing businesses. While large enterprises were seen as early adopters of ICT, small enterprises have started to place their trust in IT in recent past. 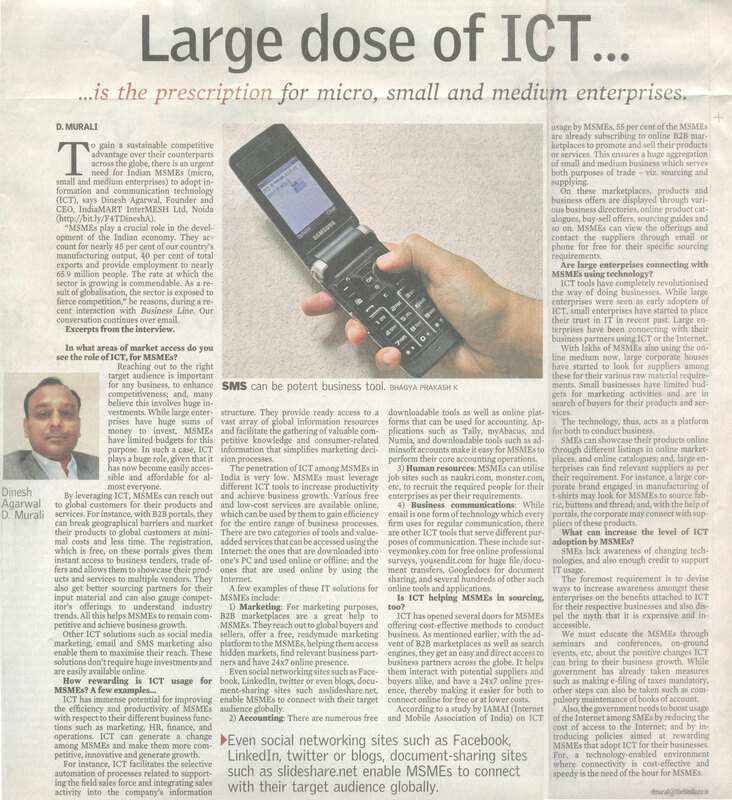 Large enterprises have been connecting with their business partners using ICT or the Internet. With lakhs of MSMEs also using the online medium now, large corporate houses have started to look for suppliers among these for their various raw material requirements. Small businesses have limited budgets for marketing activities and are in search of buyers for their products and services. The technology, thus, acts as a platform for both to conduct business. SMEs can showcase their products online through different listings in online marketplaces, and online catalogues; and, large enterprises can find relevant suppliers as per their requirement. For instance, a large corporate brand engaged in manufacturing of t-shirts may look for MSMEs to source fabric, buttons and thread; and, with the help of portals, the corporate may connect with suppliers of these products. What can increase the level of ICT adoption by MSMEs? SMEs lack awareness of changing technologies, and also enough credit to support IT usage. The foremost requirement is to devise ways to increase awareness amongst these enterprises on the benefits attached to ICT for their respective businesses and also dispel the myth that it is expensive and inaccessible. We must educate the MSMEs through seminars and conferences, on-ground events, etc, about the positive changes ICT can bring to their business growth. While government has already taken measures such as making e-filing of taxes mandatory, other steps can also be taken such as compulsory maintenance of books of account. Also, the government needs to boost usage of the Internet among SMEs by reducing the cost of access to the Internet; and by introducing policies aimed at rewarding MSMEs that adopt ICT for their businesses. For, a technology-enabled environment where connectivity is cost-effective and speedy is the need of the hour for MSMEs.